ZANONI, Jean and COGHLAN, Elisa and WELBURN, Janice and WELBURN, William (2017) Connections and Collaboration: A Library’s Commitment to Diversity, Equity, and Inclusion. Paper presented at: IFLA WLIC 2017 – Wrocław, Poland – Libraries. Solidarity. Society. in Session 112 - Poster Sessions. 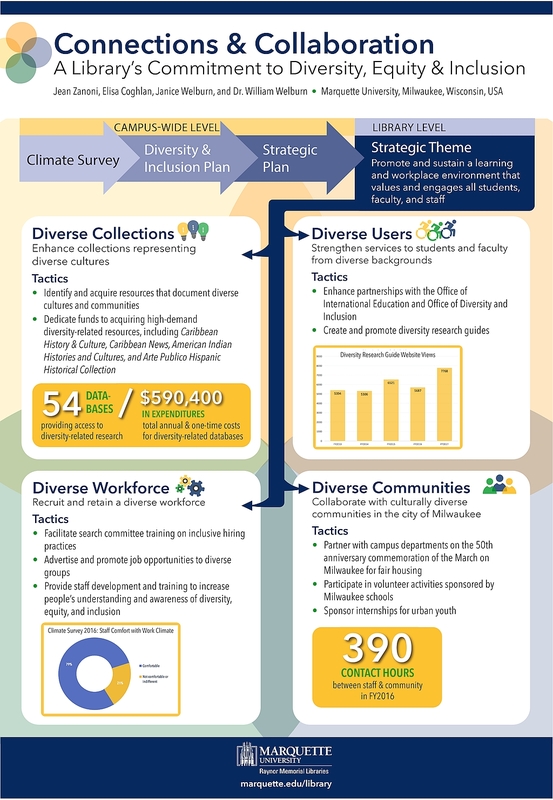 The Marquette University Libraries designed a Culture of Inclusion strategic initiative to ensure that collections and services promote and sustain a learning and workplace environment that values and engages all students, faculty, and staff. The Libraries’ commitment to equity, diversity and inclusion recognizes the dignity of all human beings and is essential to our ability to achieve excellence. The initiative encompasses recruiting and retaining a diverse workforce, strengthening services to students and faculty from diverse backgrounds, enhancing collections representing diverse cultures and collaborating with culturally diverse communities in metropolitan Milwaukee. This poster demonstrates the process used for the development and implementation of this initiative as well as evidence of the impact on the campus and the community.